The Paleo world has been arguing forever that saturated fat and cholesterol aren’t bad. But in the rush to debunk all the myths about how evil they are, we can sometimes forget the other side of the argument. Whole foods rich in saturated fat and cholesterol aren’t just not-bad; they’re incredibly nutritious. Eliminating them from your diet for fear of fat and cholesterol is actually depriving your body of important nutrition. Egg yolks are the perfect example. All the nutrition in an egg is in the yolk, but way too many people still insist on buying egg whites and throwing the yolks away. Here’s why the yolks are actually the best part – if you’re going to toss anything, toss the white, and keep all the nutritional goodness in the middle. Egg yolks are full of important nutrients, especially ones from free-range hens. Egg yolks contain almost all the vitamins and minerals in the egg. There’s just no comparison. Here’s the data for 3 egg yolks compared to 3 egg whites (Why 3? Because 3 eggs is around what most people should be eating at a single meal). *Yes, there are problems with the RDA. But at least it gives you a meaningful estimation – 0.9mg of Vitamin B6 means nothing to most people. 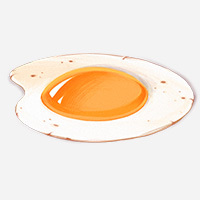 Egg yolks are more nutritious than the whites in every category but one (riboflavin). The nutrients in eggs also have some interesting specific benefits. For example, a new study just found that the Vitamin D in egg yolks might be particularly good for diabetics. People with diabetes often have Vitamin D deficiencies, and the form of Vitamin D in eggs could be particularly beneficial. Free-range eggs have 3-4 times the Vitamin D of eggs from hens kept indoors. Vitamins and minerals don’t actually cover the whole range of good stuff found in eggs. Egg yolks also have antioxidants – that’s what gives them such a bright yellow color. This review goes over some of the compounds in egg yolks with antioxidant activity. Vitamin E and selenium were listed in the table above, but eggs also contain carotenoids, which give them their yellow color. The carotenoids in egg yolks are more bioavailable than the carotenoids in vegetables, because they come packaged with fat. The carotenoids in eggs are strongly influenced by the hen’s diet, and free-range eggs have a lot more. That’s why free-range eggs have a much more vibrant yellow color (sometimes almost orange) than factory-farm eggs. Cut two eggs open side by side and you can see the difference for yourself. The deeper and richer the color, the more carotenoids in the egg. Another antioxidant in egg yolks, phosvitin, may help reduce any problems with oxidizing the iron in the yolks. Iron is an important mineral, but it’s very vulnerable to a kind of damage called oxidation (if the iron is outside your body, you can see this damage in the form of rust). Inside your body, oxidation can make the iron inflammatory – that’s why some people give blood to improve their health, or avoid eating a lot of iron. But the iron in egg yolks is safe from oxidation because it comes packaged with phosvitin. Egg whites have some antioxidants, but not the same ones. To get the full benefits of the antioxidants, you have to eat the yolk as well. It’s not like egg whites are bad for you. They do have some protein, and that’s good – protein is an important part of a healthy diet, especially for weight loss. But egg whites don’t have much of anything besides protein. Also, egg whites have most of the compounds that give people bad reactions to eggs. The proteins in egg whites can be irritating or problematic, especially for people with autoimmune diseases, and cooking doesn’t always completely denature them. If you can handle the potential antinutrients in the white, great, but they’re not right for everyone. “Free-range,” “free-roaming,” “cage-free.” These labels don’t have strict standards to back them up, so they mean nothing. 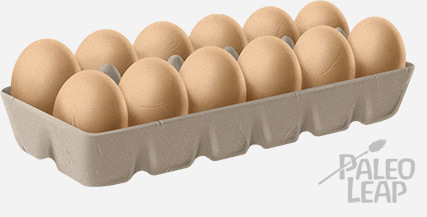 “United Egg Producer/UEP Certified.” This is a label created by egg manufacturers. Talk about conflict of interest! “Fresh,” “natural,” “all-natural,” etc. These labels are meaningless. Pasture-raised, free-range eggs are best, but even conventional eggs will be nutritious. Just make sure to eat the yolk: that’s where most of the good stuff (not to mention the flavor!) is lurking.